“The Secret Bankruptcies of Communism” is based on the most wide-ranging investigation by the State Prosecutor in the entire history of Bulgaria – investigative case No.4, 1990. This case examined the reasons and the culprits involved in the economic catastrophe left by the BCP government. The State Prosecutor’s investigation team gathered almost 1200 volumes of materials, the majority of which were classified as state secrets. 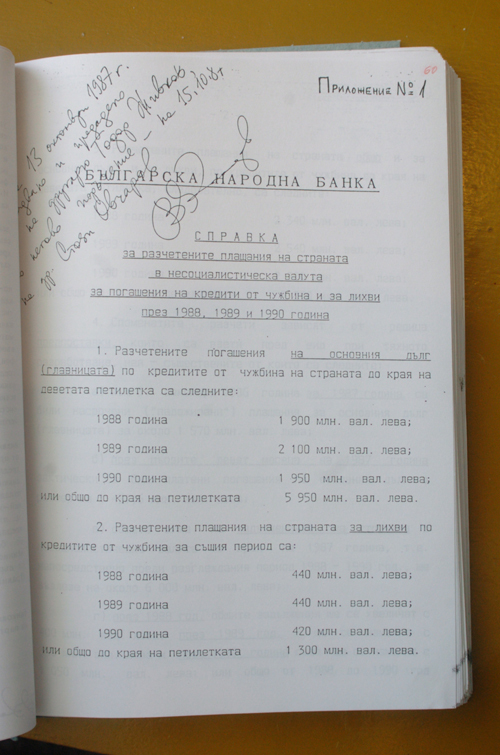 A detailed examination shows how the Bulgarian economy was managed between 1960-1989. For the first time these secret documents reveal that during the communist era in Bulgaria as a result of the misrule of the head of state, Todor Zhivkov, the country was brought to the edge of bankruptcy three times. The first time was in 1960 when Zhivkov’s government was unable to pay back loans to Soviet banks. Nikita Khrushchev refused to extend any further loans to Bulgaria and Zhivkov was forced to take a secret personal decision to sell Bulgaria’s gold reserve to the Soviet State Bank in Moscow. Between 1960 and 1964 thirty tons of Bulgarian gold was sold to the USSR in three tranches. Between 1977-1978 the communist government in Bulgaria once again found itself insolvent. It was saved with new Soviet aid agreed between Zhivkov and Leonid Brezhnev. The third bankruptcy occurred once again during Zhivkov’s period in office in 1986. Bulgaria’s foreign debt to western banks exceeded six billion US dollars, the maximum amount of money which the communist authorities were able to service. During the next three years the communist regime was able to retain power thanks the new credits provided by Western banks. By 1989 Bulgaria’s foreign debt had reached 10 billion US dollars. Hristov recounts that during the same period the communist government managed over a very short period of time in the mid 1980’s to accumulate a huge internal debt of more than 26 billion levs. The work publishes documents which show that during the 1960’s when Bulgaria had first begun to experience difficulties, Zhivkov had begun to siphon off the savings of the Bulgarian public from the State Savings Bank. One of Zhivkov’s economic advisors explains that the enormous holes left by millions of missing levs were filled with newly printed bank notes. At the same time during the entire 45 years of communist government no reference had ever been made to inflation as an economic indicator. This documentary work by Hristo Hristov lays bare one of the most widespread myths of the communist era in Bulgaria – the myth that during the communist period everyone had a good and cheap standard of living. The citizens of Bulgaria, however, had not the faintest idea of the huge price they and their children are still continuing to pay for this illusion created by Zhivkov and the debts of communism.